The City of the Damned. We are excited to announce that Alexander Winberg (of the excellent Echoes of Imperium blog), invited us to take part in an event to celebrate the 20th anniversary of Mordheim, Games Workshop’s Old World skirmish game! More than probably any of GW’s other games, Mordheim really delves into the dystopian horror elements that lurk within most of their settings, bipedal rats, ambulatory fish, shambling skeletons, religious zealots, and rotting tenements. Being 20 years since the game was released, the Mordheim event is also set 20 years further in the timeline, Imperial Calendar 2019. 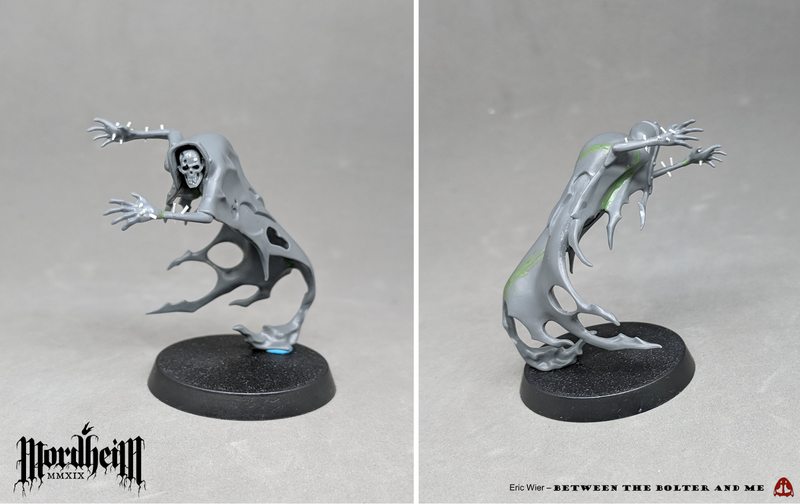 While Alex defined the basic motivations behind the major factions, Tears of Envy, another extremely talented hobbyist involved in the event (who made Mordheim 2019’s excellent logo, which is on each of the pictures included on this post! ), had the fantastic idea of looking at the city of Mordheim through the lens of the Strugatsky brothers’ Roadside Picnic/Stalker. This science fiction classic explores the aftermath of an extraterrestrial visitation. Despite the alien visitors abrupt departure, their presence irrevocably and mysteriously changed the environment where they visited. These “Zones” were eventually cordoned off from the wider world to be studied. 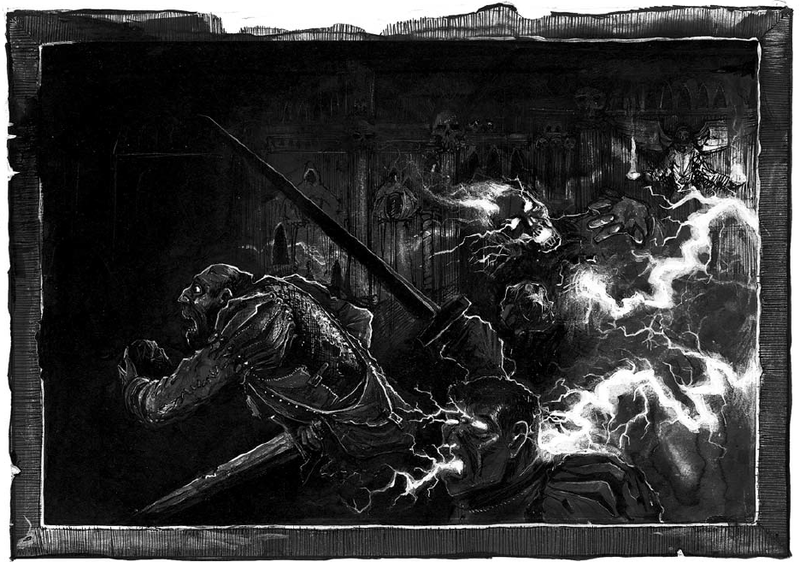 Could the meteorite that hit Mordheim have a similar effect, and what would happen to the city after being poisoned by this wyrdstone for 20 years? How would its inhabitants and the city itself be affected and corrupted? And what sort of adventurers would risk their lives to find fortune by venturing into the City of the Damned? This concept really captured our imaginations, leading us to start experimenting with different warband designs, which we wanted to share some of our early work in progress. Bladegheist Revenants models were used to convert these spectral undead. The Revenant masks were replaced with regular skulls to make them look more like tradition skeletons. One of the most iconic and memorable elements of Roadside Picnic are the enigmatic Anomalies that are found within the Zone, odd and often dangerous phenomena/entities that seem to defy Newtonian physics. Bug traps are invisible spots that exhibit extremely strong gravity, able to crush anything that walks into it, or propel it into the air. Hell slimes are caustic colloidal gases that transform most of what it touches into more of the slime. The book is filled with many of these enigmatic entities, and I thought it would be interesting to explore the notion that prolonged exposure to wyrdstone has warped many of the undead into creatures resembling some of these Anomalies. What had once been physical beings, moldering bones and rotting corpses, have slowly lost their corporeal forms and now interact with the living inhabitants of the city in curious ways. Like the Anomalies in Roadside Picnic, I did not want the undead to have obvious weapons. I used small pieces plastic card to create the stakes and nails piercing the undead’s limbs and skull. 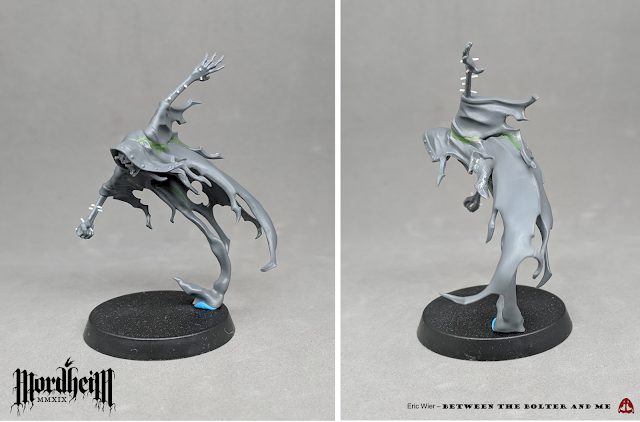 While I am still conceptualizing and considering ways to make some of these ideas into models, the new Nighthaunt models from Age of Sigmar seemed like an ideal place to start. 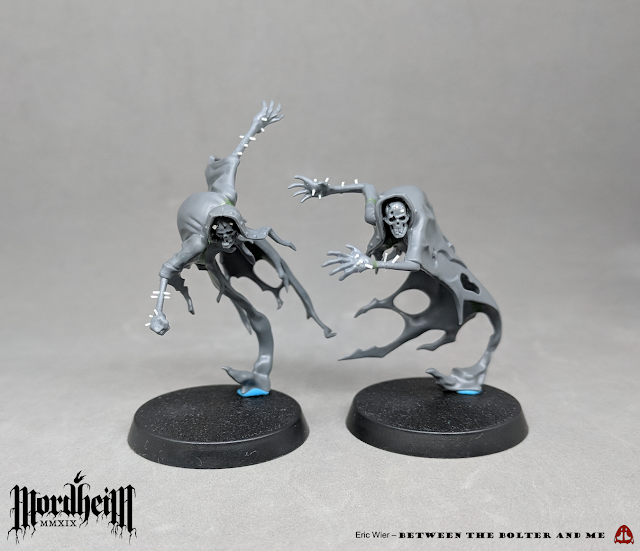 They are a nice combination of classic skeleton and ghost/wraith elements, which fits with the idea of undead losing their hold on the physical realm. I decided to get a box of Bladegheist Revenants to start experimenting with, since I think they are one of the best looking Nighthaunt units. I really like their incredibly long limbs, thinking they impart an unsettling air to the models. To make the models appear more like spectral skeletons, I replaced the Revenant iron masks with skulls. I also removed the models’ swords, feeling that these tortured entities would have no use or motivation to wield physical weapons. To convey the torment of their existence, I decided to cover the models’ hands, arms, and skulls with nails. These were primarily constructed with tiny rods of plastic card, each between 0.4-0.5mm in diameter. I am uncertain of how I want to paint these first few models. At the moment, I am not sure if these spectral skeletons are finished. I am pretty happy with how they look so far, but as I experiment with other designs for the warband, more ideas may emerge that shape them. Any input or suggestions would be appreciated! Expect to see more posts in the future as this warband and others progress. These look great, dude. Removing the swords makes them more threatening, if anything. The nails thing is an aesthetic I've seen popping up more and more regularly in recent times, and it always looks great. Maybe you could add some nails along the spines? The arms and skulls and trailing ends of the robes have so many spiky bits and sharp edges, the hunchbacks look pretty plain and under-detailed as a result. Can't wait to see the progression of this project! Thanks, I am glad you like them so far! I really agree they look better without their weapons (even though their swords were nice). I think you are right about adding some stakes and nails to the models' backs; it will add some interest and help unify the design. Those are really nice conversions. The nails add an extra air of menace, and separate them from the ghosts and reapers that appear in the Mordheim art, which always felt more like a metaphor for the death stalking the streets than true entities. 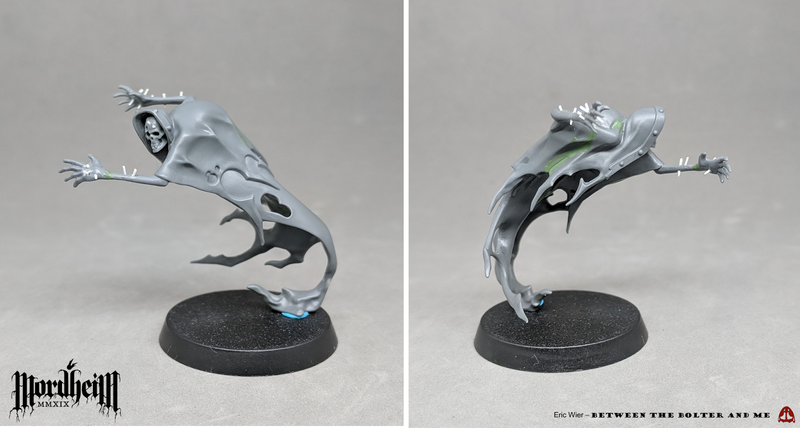 I’m having similar trouble deciding on a scheme for Nighthaunts, in my case from the Soul Wars box, exacerbated by the interaction between the spectral bodies and apparently corporal weaponry etc (leaving aside the question of if the skulls are bone or just manifestations), which is hard to avoid without going in the direction of a mono coloured force suggesting bodies and weapons to all be ghostly, which utterly robs the models of definition at tabletop distance (as fast as an oxide wash over white promises to be). I can’t wait to see the places this project goes. 20 odd years ago I remember pouring over the original Mordheim articles in White Dwarf, and the few photos of the converted warbands (as GW tentatively began along the path of multipart empire soldiers and the like) that were shown alongside Tuomas Pirinen’s original rule set in all its flame bordered glory. 20 years on from that the option available and the sheer levels of art and imagination poured into the hobby by GW and the community look set to produce something incredible. I too have strong memories of pouring over White Dwarf issues after Mordheim's release, getting lost in the morbid imagry and decay. It is great to go back to it all these years later! 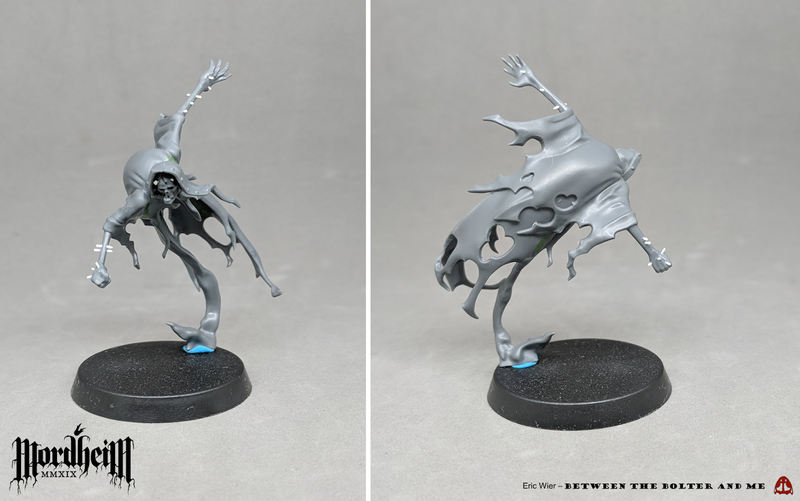 Yeah, the nighthaunt models are interesting. Their seemless integration of physical and incorperal elements make the painting process difficult to define. I suppose that is why they released the technical paints, but just resorting to those seems like wasting an opportunity. Exciting news! Can’t wait to see what all you guys come up with! Mordheim is such a good setting and the nails you’ve added really fit in with the bleakness and hopelessness that justboozes from every page of the rulebook. Look forward to seeing more. Thanks, I am pretty excited to actually give Mordheim a try! Great to have you on board guys! Glad I've inspired in some small way. These spoopy chaps are looking ace. Thanks for constantly having something inspiring on your blog! I distinctly remember reading about proto-mordheim in my college apartment, and really enjoying the look of the gang converted from Cawdor figures, something that would be 100 times easier now that there is a creepy Cawdor gang in plastic! As for your nighthaunts, I think they look great, and the absence of weapons will make any that DO have them all the more imposing. Thanks! I am glad you like them. They have been fun and quite easy to make. The plastic Cawdor models certainly have been a boon for creating wretched looking humans! Adam is actually using parts of that very kit to build some models himself! Paul Sawyer did a possessed warband converted from the original metal Cawdors back in White Dwarf at the time! 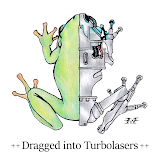 A Hurculean effort! Great work on these spectres, Eric... looking forward to seeing where this goes.